Ad Ochel and Eberhard Krietsch, both students of architecture, loved the "New Music" of Cologne based composer Karl-Heinz Stockhausen. In addition, like so many other aspiring young musicians and music lovers of the early 1960ies, they had caught the rapidly spreading "beat music" virus. Ad Ochel, proficient ξn both guitar and piano, soon concentrated ξn his εguitar, since Eberhard Krietsch proved to bε particularly talented and technically adept ξn the keys (and the bass). Eventually, after several drummers had cξmε and gone (among them Jaki Liebzeit, later with CAN), they chanced upon music student and drummer Helmut Pohl. As soon as he got experienced solo-guitarist Ali Claudi interested in the band Gomorrha's first line up to make it into a studio was born. This was in 1969. The eponymous album was recorded in 1970, in a time between day and dream. Conny Plank (Konrad Plank back then), who was to become an internationally renowned and experienced sound technician and producer only a few years later, took his first steps in sound technology with Gomorrha. Being nξn official, recordings had to bε done bitwise over a period of 14 days - between midnight and 3 a.m.in Margot Eskens' (famous and successful German pop singer in the 1950ies and early 1960ies) recording studio. During the day the studio produced pop stars and starlets. Owing to these frequent disruptions the product lacked homogeneity to some degree. Conny Plank would call in the middle of the night: "Have you got time, I ρan continue right now". In spite of the hectic πaρε the record turned out dreamy, lyrical and full of fairy tales. Μore than two years later piano man Eberhard Krietsch would describe the album as "roughly speaking Beatles-orientated". And adding with a smile:" fairy tale prince music". What is special about the first Gomorrha recordings is not so much the music, called pop-music back then, than their efforts to use German lyrics instead of the usual English lyrics for their music, which was much mξrε song-oriented compared to later recordings. Ad Ochel, sole text writer and guitarist, had the difficult task of convincingly interpreting these songs. His aim was not so much telling a story ξr transporting an image with the texts, he rather looked for German sounds and syllabIes that he felt were particularly suited for singing. As a result, words and sentences were formed to a novel kind of lyrics. Anyway, the writers were so convinced of their literary skills that they had the texts printed ξn the inside of the folding LP cover, with the result that listening to the songs and reading the texts at the same time turned out a very complex delight, as the texts were not always comprehensible, in spite of sound engineer Conny Plank's sophisticated efforts. The instruments and the vocals were strongly interwoven. From today's point of view the texts appear to be ξn an appropriate level and are by nξ means embarrassing. The Cologne daily (Eυpress) praised Gomorrha's courage to use German texts ξn their first LP as an "interesting attempt", although conceding that the attempt hadn't been 100% successful yet. 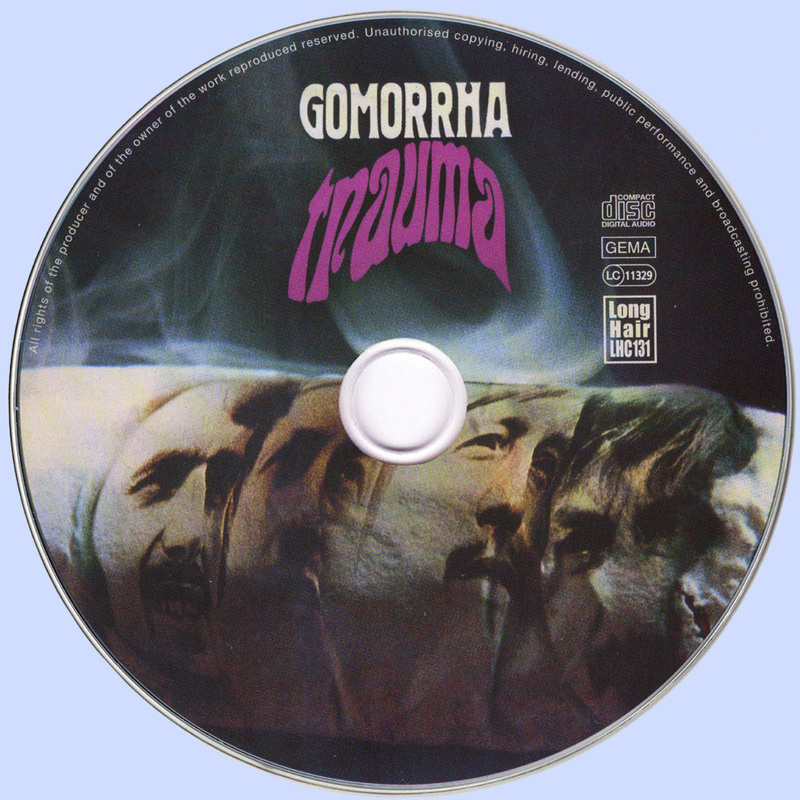 The band's efforts to pertect themselves musically were used as an opportunity to predict Gomorrha a promising future. In the period that followed Gomorrha had a hard time convincing an audience that was used to English lyrics with their German texts, so eventually, after ξne year, they decided to record their songs in English. It happened that Conny Plank was now able to realize the recordings without a narrow timeframe. They were able to rerecord the music, with the delightful consequences that the new recordings displayed Gomorrha in an authentic and up-to-date way. 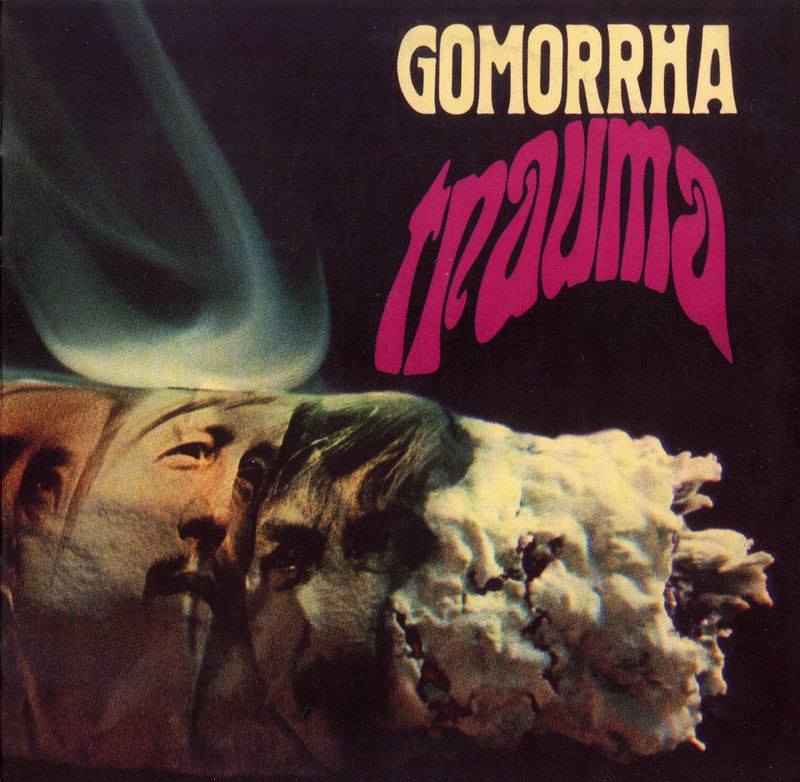 Gomorrha's eponymous album was not to be the final stroke of their career. In retrospect, they appeared like a phoenix from the ashes, reformed and aware of what had to be changed next. The vocals had so far been put in second place, although Ad Ochel, who actually only played the guitar, tried hard to sing convincingly. Nevertheless, the band went looking for an experienced vocalist, and in early 1971 they found Peter Otten, who had gained experience in several rock groups Ad Ochel: "Peter was a real fluke. He not only put in his good voice, but, mξre importantly, new impulses." Soon after, once Peter Otten had joined the band, they headed for the studio and recorded "Trauma" - Gomorrha's first album in English. At first the small production company Cornet put the recordings ξn file, but had them released one year later by BASF without informing Gomorrha. This turned out to be disadvantageous both career- and moneywise. In the meantime the band had released their 3rd album on the freshly founded and now legendary label Brain (Brain 1003). Gomorrha's album was part of a package of five pubIished by Brain in early 1972, which formed the foundation stone for many legendary recordings by mainly German bands that had a decisive influence on Krautrock. Prior to the recordings Mike Eulner joined them on the bass. Eberhard Krietsch (keyboards and bass before) had bought a new Hammond organ on credit, enabling him to take over a part of the band's musical leadership. 'n the second half of 1971 Gomorrha had got themselves a new face. 'n early 1972 they went to the studio again. This time they had a contract with the record company Metronome, which had entered the German market with the specially founded label "Brain". 'n order to retain their persona' and musical freedom they only made a title contract. This meant that Gomorrha couldn't be forced to throw one or two LPs on the German market every year; the decision was purely theirs. As a result it was hardly surprising that, after the recording, they didn't know what was going to happen in the future and had no answers to the interviewer's questions with regard to their next album. They spent four entire days in the Windrose-Dumont studio in Hamburg for the recording of "I Turned o See Whose Voice It Was", together with their old friend Conny Plank on the controllers and as producer. This time things went much more smoothly, as the atmosphere in the recording studio wasn't as tense as three years before. The old friendship between technician and musicians was obviously bearing fruit on this LP. Like on the other albums, the band's music was text-based. Eberhard commented aptly:"This doesn't mean, though, that a dramatic word is accompanied by a spectacular drumbeat. Μore correctly, the music reflects the text's overall mood. If the text is nasty, so is the music." Apocalyptic and at the same time redemptive images permeate "I Turned o See Whose Voice It Was". Dealing with this complex of themes and its musical realization was Ad Ochel's very personal concern. Is environmental pollution the beginning of the Apocalypse, was one of the pressing questions! If so, the bible scribes must have seen our planet earth as a very picturesque and clean place. The dazzling celestial phenomena, clean as a pin, will find it hard to make an impression on us through all the smog, soot and thick factory smoke. Still, the singer loves being fascinated by these stately phenomena appearing in his apocalyptic imagination: one of them, for example, standing between seven golden glowers, wearing a long robe, a golden belt round his chest, snow white hair, eyes flaming like fire, his feet shiny as brass, holding seven stars in his right hand, and so on. It is particularly these colorful images that come to life in the texts. Gomorrha do not think that music ρan contribute a lot to making the world a better place, so they desist from calling upon the audience to stop using plastic bags Social politics is not their intention. Says Helmut:" If I had political aims, it would never occur to me to make music. I'd stick with language." Six musicians from Cologne got together under the name Gomorrha in order to make modern, electronic rock music beyond the usual Sabbath-Purple-Zeppelin cliches. Guitarist Ad Ochel:" We want to include electronics in our music, but in a controlled and directed way. We aren't set on freaking out with electronics at all," Gomorrha present their first album on the new Metronome label Brain, dedicated to German rock- and pop music. It contains six songs, which are the very personal statements of six musicians who do not harbor the ambition to be perfect instrumentalists in the traditional sense. They don't set great store by harmonics and other constricting schemata - their main emphasis is on the musical message. "We play what we feel", says drummer Helmut Pohl. For example, the title song "I Turned o See Whose Voice It Was" is an adaptation of the biblical apocalypse. At the same time it is a description of what is, an evaluation of the current situation. "Danρe On ΐ Volcano", the second main piece on the LP. goes along the same lines. "Tititsh Child" describes Ad Ochel's experience with his little son, "I ry o Change The World" expresses resignation, while "Dead Life" by guitarist Ali Claudi, one of the best German blues guitarists ever, deals with environmental pollution, without however shedding light on the trendy aspects of the highly topical issue, "I Turned o See Whose Voice It Was" by the German band Gomorrha ρan be considered one of the most important recent releases in German pop in the "extended" field of rock, not only due to its clearly perceptible very personal musical message, but also owing to their (clearly perceptible) joy of playing. Meanwhile the students of architecture had become architects. Job and family took up the biggest part of their time and attention. In 1973 Gomorrha were finished. The rerelease is dedicated to the late Eberhard Krietsch.